What I did was create a healthier version of an old-time calorie filled comfort food. I replaced processed white bread and butter with whole grains and flavor. The mustard and cheddar cheese are packed with flavor and allow you to decrease the calories by increasing the taste with bold flavors. Instead of adding butter to the outside of the bread I grilled my sandwich on my ElectriChef Grill. The total calories and fat are...drumroll please: A little over 300 calories and 11 grams of fat. The best part is there are 5 times the dietary fiber (5 vs.0 grams) and almost three times the protein (13.4 vs. 4.2 grams). 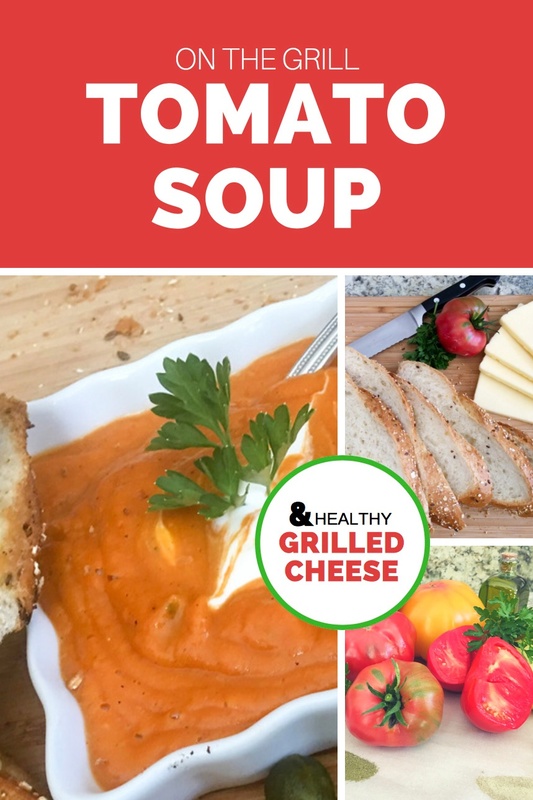 To even pack my comfort food meal with more nutritious value, I decided to add another recipe which pairs fantastically with “nutritious and delicious healthy grilled cheese sandwiches”...Grilled tomato soup. Sound interesting? I also modified this family favorite recipe by removing the cream and added a few grilled potatoes and herbs with locally sourced heirloom tomatoes. 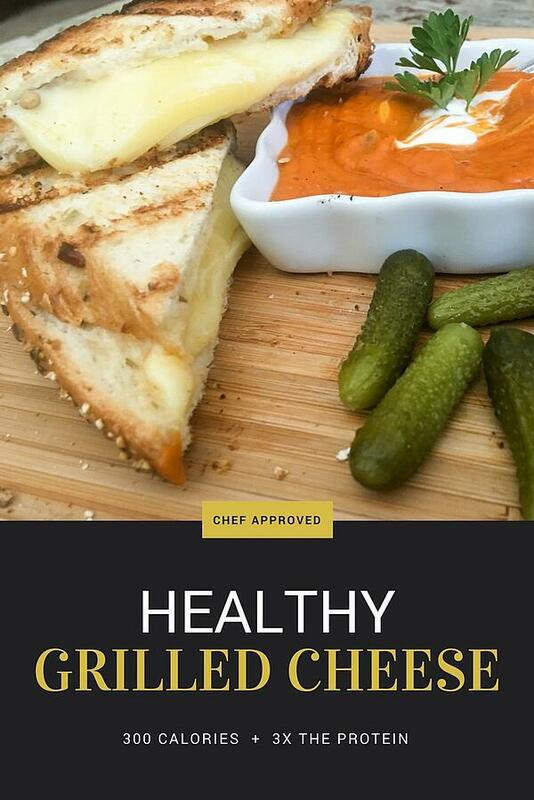 The combination is high in flavor but low in calories (about 100 calories per serving) and can be enjoyed slightly chilled or warm on a cool rainy spring day right next to your grilled cheese sandwich. Celebrate the passing of tax day with a comfort food you can grill and enjoy with the whole family. Here’s my recipe for both, happy deductions! Spray your ElectriChef grill grates with Canola oil then preheat your Electric Grill to 425°F. Spread mustard or sauce on one side of each slice of bread and place 2 slices of cheddar cheese on one side and top with another slice of bread, repeat for three sandwiches. NOTE: Because the sandwich will be on the grill, I recommend to try to keep the cheese from hanging out of bread. A little cheese beyond the crust is great for melting and presentation, too much may cause a flare-up. Once the grill is at temperature, carefully place sandwiches on grill grates and close grill lid for 4-6 minutes depending on the size of grill. You want to begin melting cheese and toast bread. Carefully turn each sandwich once and close grill lid for another 4-5 minutes. 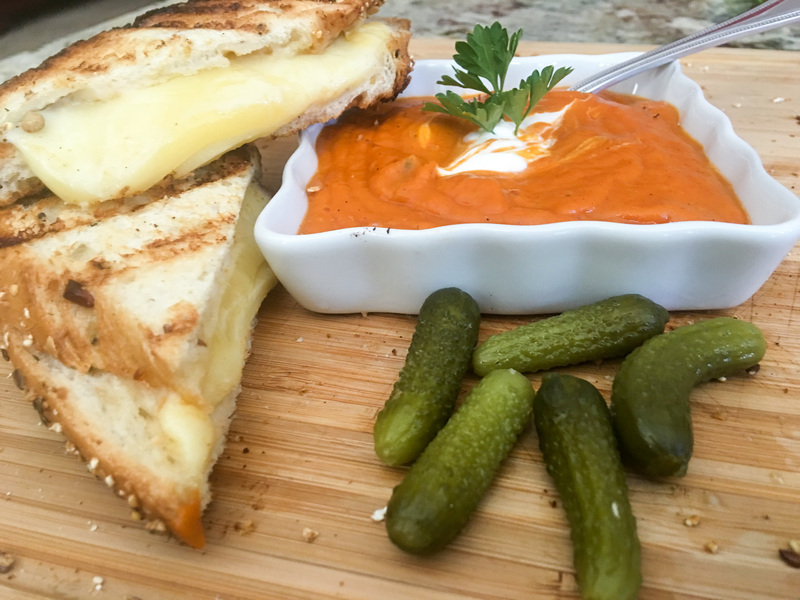 Remove from grill, cut the grilled cheese sandwich on a bias and serve with a Grilled Tomato Soup (see recipe below) and pickles! Spray your ElectriChef grill grates with Canola oil then turn on your Electric Grill to 425°F. Pour about a 1/2 cup of water into the drip pan. As soon as you turn on the grill, place tomato, potato, onions and garlic (I usually place garlic in foil with a drop of oil so it does not char) on to the grill and close the grill lid. The water will begin to steam and help the potatoes and onions to cook, this will take about 3-4 minutes. Once steam is gone the vegetables will begin to grill, close grill lid for another 7-8 minutes and turn potatoes and onions once. Close the lid again for another 5-6 minutes and check potatoes to see if they are fork tender. The tomatoes should be tender and the garlic and onions should have a light char. Place everything including olive oil, garlic and herbs into a VITAMIX or blender immediately, pulse until the ingredients are puréed. Add salt and pepper to taste, add broth or water to thin soup. If using a VITAMIX, put on soup mode and let all the ingredients blend until hot. If using a blender, pour soup into a medium saucepan and heat to the desired temperature. Top with a drop of sour cream and a sprig of basil and serve with my Nutritious & Delicious Healthy Grilled Cheese Sandwich! What's Next? Don't forget to sweeten things up! Check out Chef's recommendations for desserts on the grill. Subscribe for Fresh Grilling Tips and Recipes! 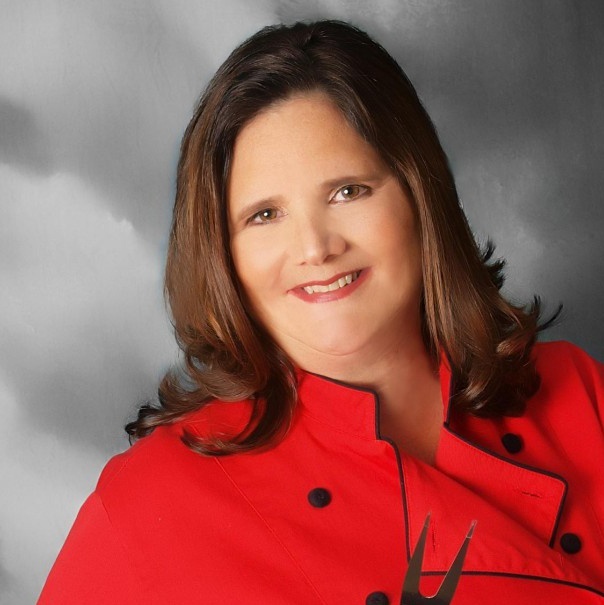 Chef Paulette specializes in recipe modification & locally sourced meals, proving to be both "nutritious & delicious". 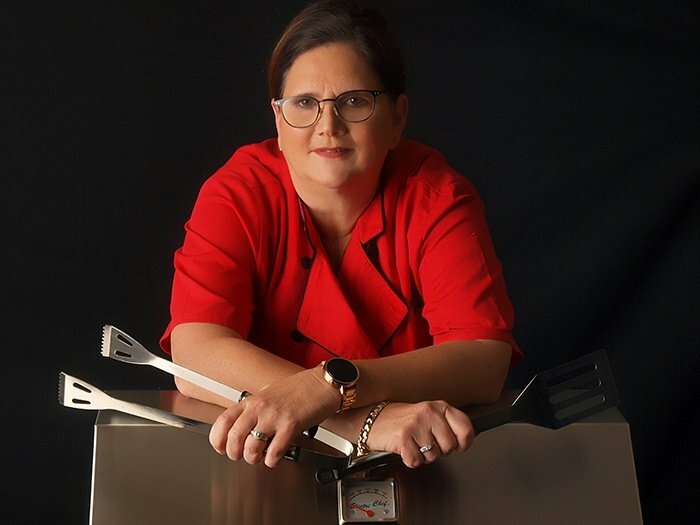 She is passionate about the versatility and superior grilling power of Electri-Chef. 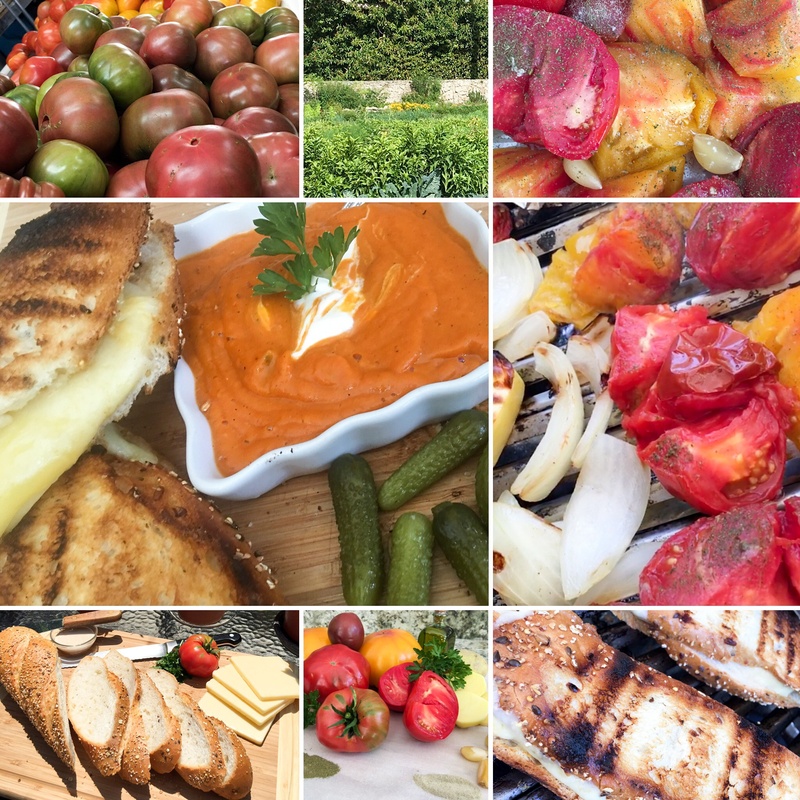 Explore her grilling recipes throughout the blog. ©2019 ElectriChef. Made in the USA.